Custom Shop 2014 '64 Heavy Relic Precision Bass, 4-string bass guitar from Fender in the Custom Shop Precision Bass 2014 series. 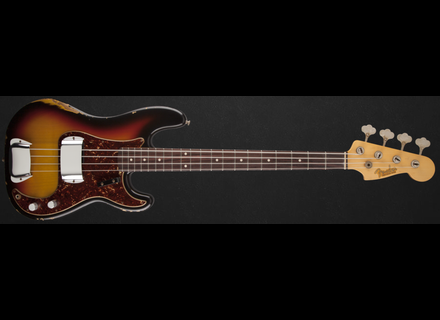 The brand-new Fender 1964 Precision Bass with bleached three-color sunburst finish recreates the sound of the year that saw the release of many great Motown, Stax, surf and other cool records of that era. Includes case and certificate of authenticity. Mesa Boogie launches a bass amp head Mesa Boogie introduces the Bass Strategy 8:88, a new all-valve 465W bass amp head for power fans. EC Pedals launches a fuzz pedal for bass EC Pedals and Michael Benson collaborated for the creation of FuzzDriver, an effect pedal for bass that combines a fuzz and an overdrive. EBS Classic Session 120, Ibanez Promethean P3115 and Peavey Max 115 Comparison Imagine for a moment that a fellow dressed as the mailman shows up at your door when you are about to start playing your favorite instrument: "Ding-dong! It's the mailman! I've got a parcel for you!," says an affable figure, all sweaty, with a tone that is meant to be cheerful.